The Los Angeles County Sheriff’s Department arrested one driver for driving under the influence of alcohol while conducting a DUI/Driver’s License checkpoint on Friday, January 25, 2019. The checkpoint was at the westbound lanes of Palmdale Boulevard at 17th Street East between the hours of 6:00 p.m. and 2:00 a.m. In addition, 19 drivers were cited/arrested for operating a vehicle unlicensed or with a suspended/revoked license, two arrested on other criminal charges, 21 Citations issued, and seven vehicles towed. 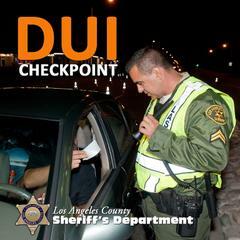 DUI Checkpoints are placed in locations based on collision statistics and frequency of DUI arrests. Last year the Los Angeles County Sheriff’s Department investigated 395 DUI collisions that killed 21 people and injured 590 others. Drivers caught driving impaired and charged with DUI can expect the impact of a DUI arrest to be approximately $13,500. This includes fines, fees, DUI classes, license suspension and other expenses not to mention possible jail time. The Los Angeles County Sheriff’s Department reminds drivers that “DUI Doesn’t Just Mean Booze.” Prescription drugs, particularly those with a driving or operating machinery warning on the label, can impair and result in a DUI. Marijuana can also be impairing, especially in combination with alcohol or other drugs. The Los Angeles County Sheriff’s Department will be conducting other DUI/Driver’s License Checkpoints and DUI Saturation Patrols throughout the year in our ongoing commitment to take suspected impaired drivers off our streets and highways, ultimately lowering the risk for deaths and injuries. Funding for this checkpoint was provided by a grant from the California Office of Traffic Safety, through the National Highway Traffic Safety Administration. MEDIA NOTES: To schedule an interview regarding the Los Angeles County Sheriff’s Department Traffic Safety Operations, please contact Sergeant Robert L. Hill at 323-890-5480 or via email at RLHill@lasd.org.